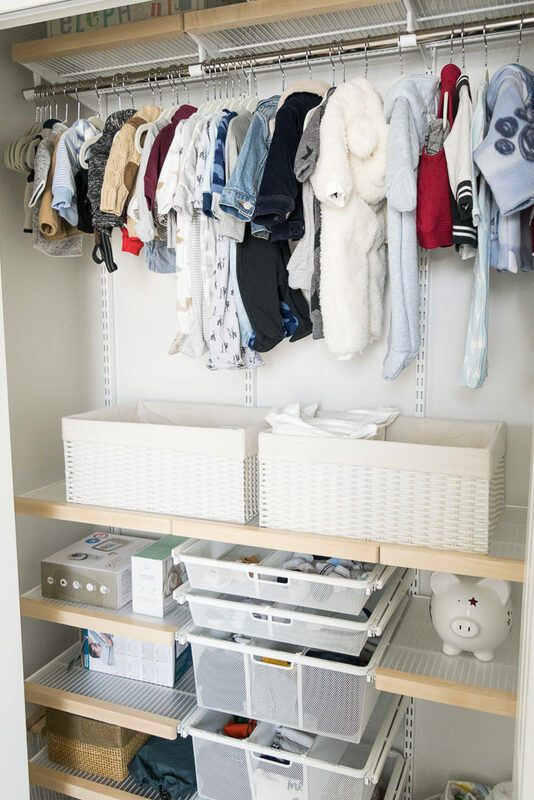 Our nursery closet got a serious redesign, and I am so thrilled with how it turned out! Organized, functional spaces make my heart sing. 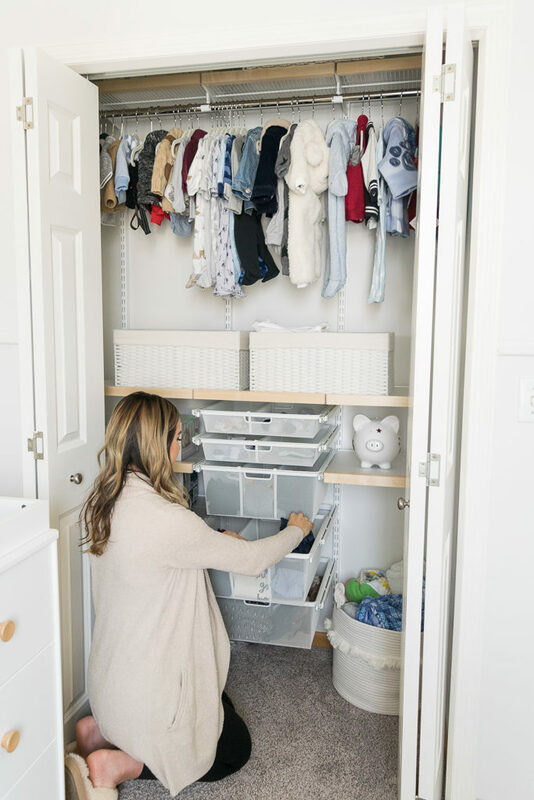 🙂 Today I’m sharing all the details on our new nursery Elfa closet system & organization, courtesy of The Container Store and Lauren from Neat Method Minneapolis. 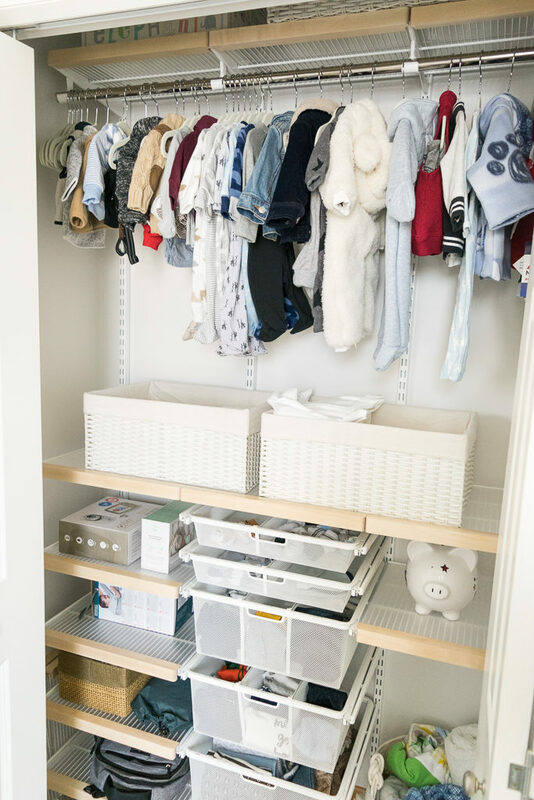 We had so much wasted space in the previous closet design, and it was less than ideal for a nursery, as baby clothing and accessories are so little! 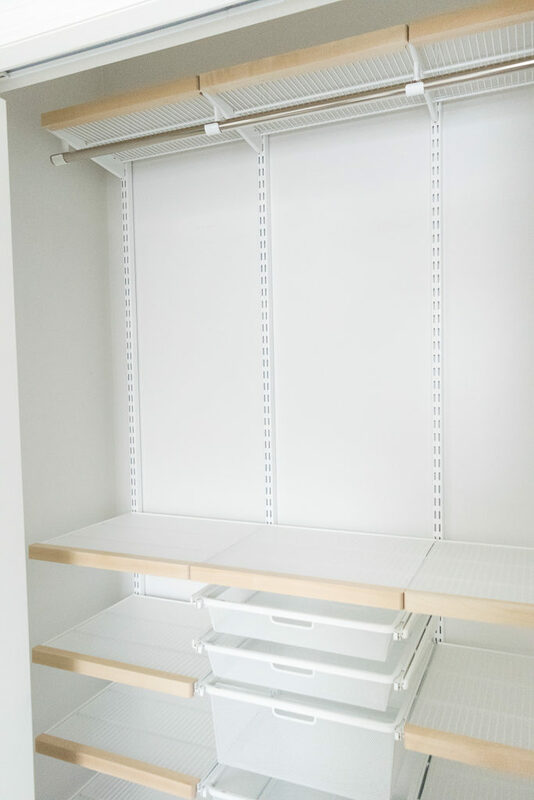 The Container Store’s Elfa system really helped us maximize the smaller space we had available in the closet, and the system is practical for any space that needs a little help in making the most of it. 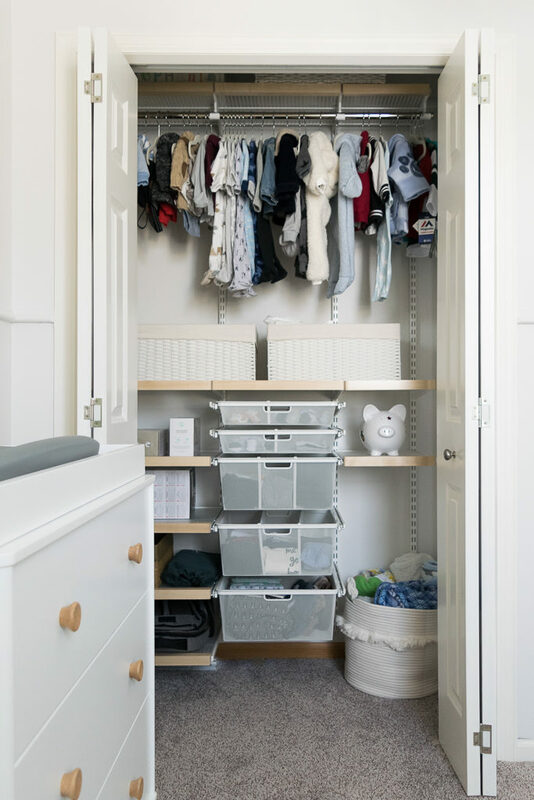 They have a wide variety of best selling solutions, as well as custom closet solutions to best fit your needs. Now how about a little before and after?! 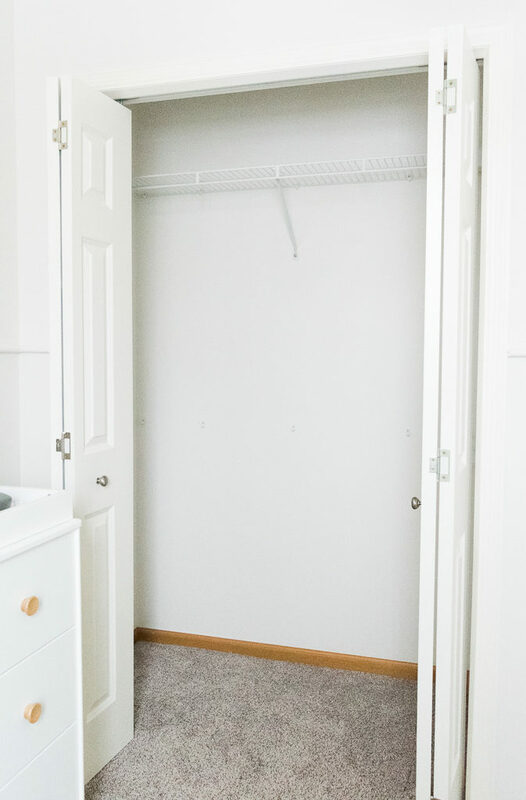 We worked with Lauren from Neat Method Minneapolis to create our custom closet, since the process can be a little overwhelming with so many choices! 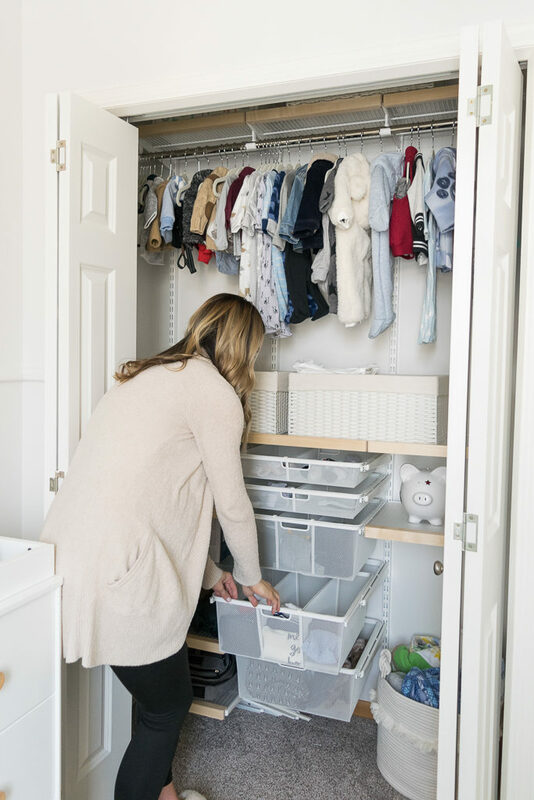 She listened to our goals for the closet, which were accessible storage and simplified organization for baby’s clothes from newborn to 12 months (we received a variety of different sizes from baby showers, and babies grow so fast! ), accessory and shoe storage, and miscellaneous shelving for baby gear. 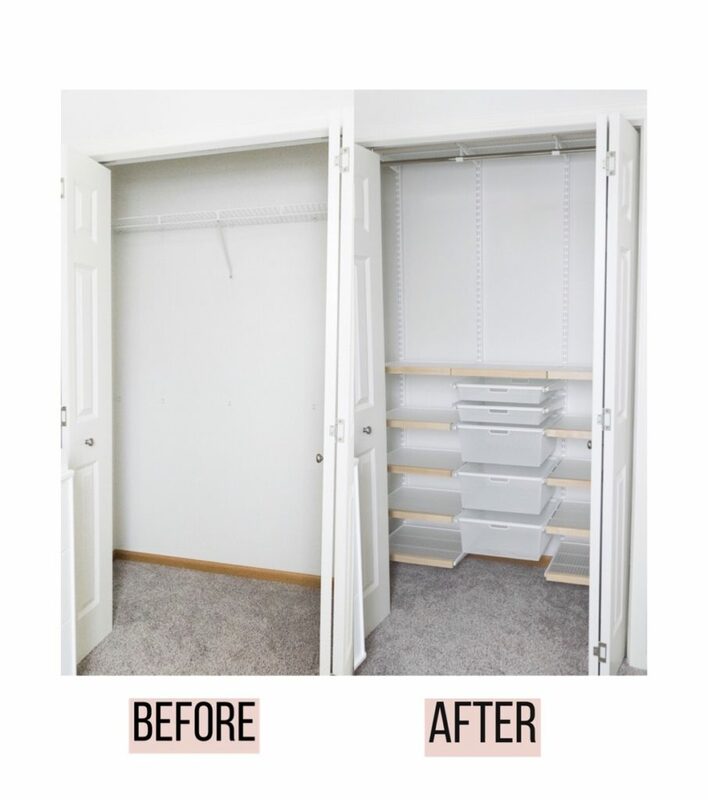 Lauren then worked with The Container Store to create a custom closet using the Elfa system (The Container Store’s original custom shelving and drawer system). She sent us a draft of what it would look like, and we went from there! 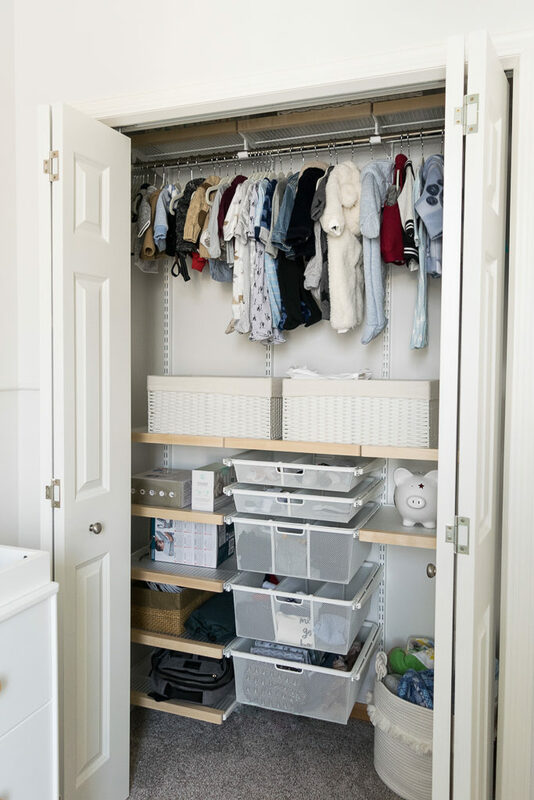 With the Elfa system, you have the option to install the closet yourself or have one of TSC’s professionals deliver and install the system for an additional fee. We decided to have a professional install it for us and are very happy about our choice to do so. 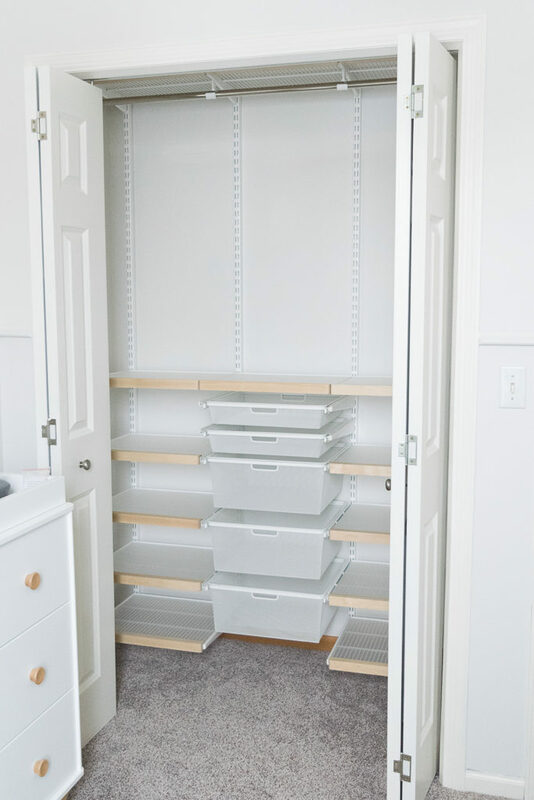 The installer was friendly, took under 2 hours to install the closet, and once it was completed, he explained how we can customize the closet easily down the road if we have the desire to shift anything around. It was a really smooth process! The Container Store is currently having a huge Elfa Sale going on right now until February 26th, so it’s a really great time to purchase a system if you are thinking about it! ALL Elfa and Elfa installation are 30% off! Huge savings, friends – don’t sleep on this one! 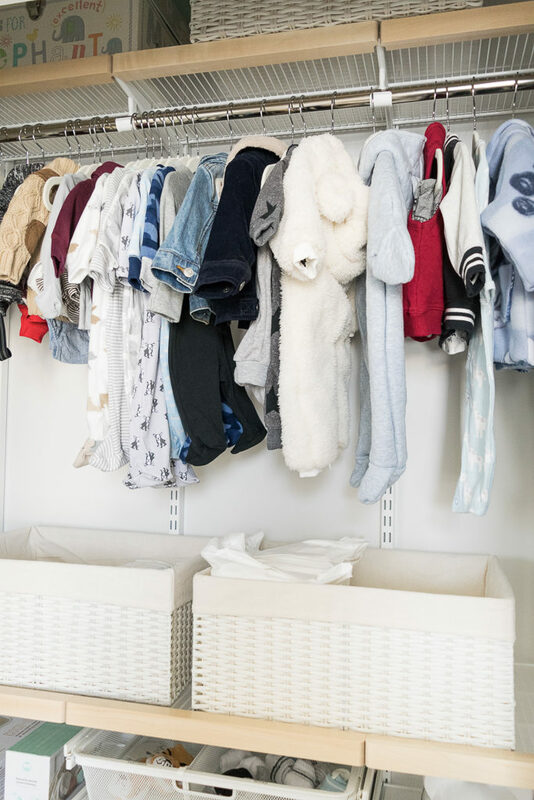 Once the closet was installed, Lauren from Neat Method Minneapolis came over to help us get all the baby clothes and goods organized and tidy! Having Lauren help with this step was super beneficial, because I know I would’ve spent 10x the amount of time she took to decide where things should go and how to order everything if I didn’t have her help! 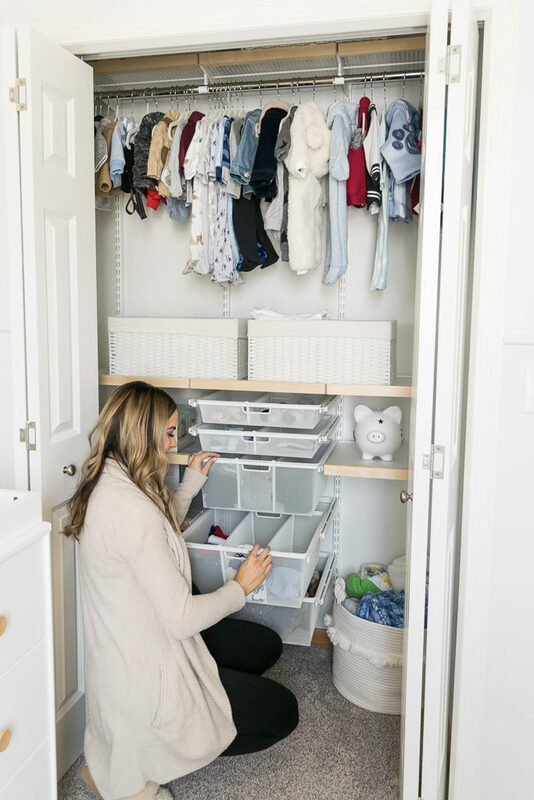 She also used a label maker for our drawers and organized by size, onesie type (short sleeve and long sleeve), pants, blankets, footsies and hats, and added in some Elfa dividers for the drawers to keep everything neat and organized. 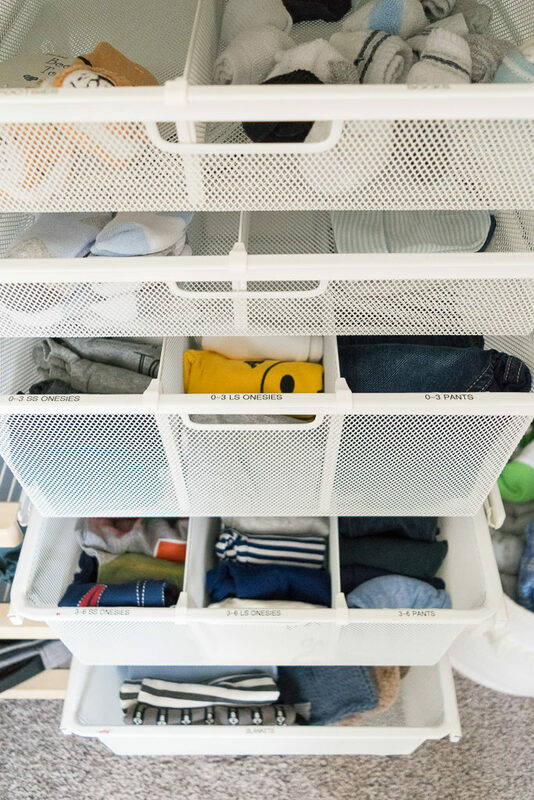 She also shared how she folded everything Marie Kondo style, which makes everything easy to see and keep tidy! 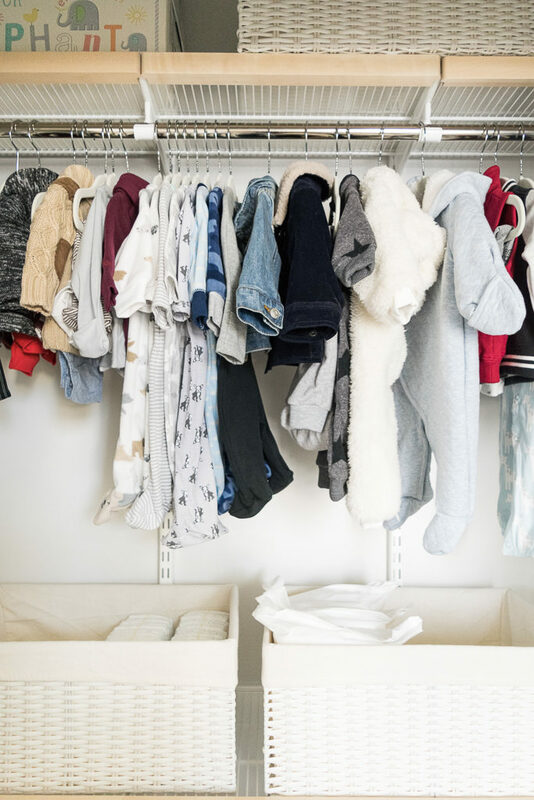 Lauren and I also worked together last winter on our master closet – we didn’t install a closet system, she just helped us organize everything and tidy it up. She is a miracle worker, and I highly recommend investing in the help from Neat Method! What a difference, right?! 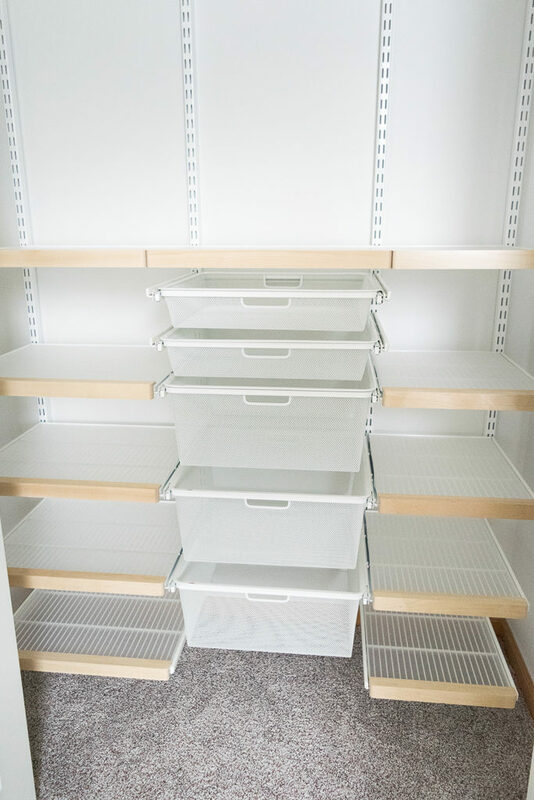 I am so happy with our service from The Container Store and Neat Method Minneapolis and would recommend them to anyone seeking assistance with maximizing and organizing their space, whether that be a closet or another storage space that needs a little TLC! This post contains gifted product and services from The Container Store and Neat Method Minneapolis.